BatAction Machine - What Makes It Better? BatAction Hitting Machine - What Makes It Better? 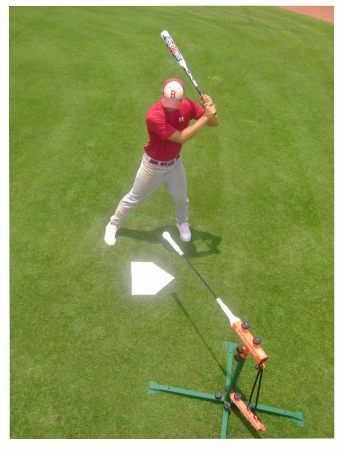 What makes this machine's unique design so important to hitters? The Bataction "Self-Trainer" has a "horizontal hitter" design. This feature offers four definite advantages over "vertical" machine designs. The first advantage is that this machine allows the hitter to read the quality of his swing by the path of the batted ball. The ball will go where it is hit. He can see if he just hit a fly ball, ground ball, or a line-drive. The second advantage is that the Self-Trainer" allows maximum "BANG TIMEl" time during practice swings. It allows you to feel the bat drive through the hit ball. There is no cable or rope controlling the ball vertically that stops the ball's forward motion. On vertical machines, no matter how well you hit the ball, you always hit a "pop-up" because the ball is "jerked" upward by the controlling cable or rope. The third advantage is convience and versatility. The batter can practice hitting a moving ball that comes in at the speed he desires from a distance that is perfect for practice. The machine allows the batter to hit a moving ball or a "still" ball every 5 seconds. The height can be adjusted for a hitter in less than 20 seconds. The total unit weights less than 45 pounds. The batter never has to stop, chase or pickup balls. The Bataction Hitting machine is 100% energy efficient. All of the energy and effort exerted is used to become a better hitter. Kids love to practice hitting. They hate picking up or rounding up balls. The fourth advantage is ball "TRAVEL TIME". This is the distance that the batter is allowed to see the ball coming in and the amount of time that the batter is allowed to see the ball travel after impact. This innovative Bataction Machine feature allows the batter to experience batting practice that closely simulates real game situation hitting. This feature also challenges the hitters and keeps them motivated to get better, which is a key to success. Great deal! Item is a must if you coach any age group between 13-18! Extremely well made and most beneficial. Great help for all ages! Thanks ! Very Good product! May buy more for my high school team! Excellent Machine at a Great Price! Highly Recommended! Thanks, Nick! Awesome Machine! Highly Recommend! Great To Deal With! Buy the BatAction! Great Product! Fast De-livery! Excellent Customer Service! Nick cares! Great to Deal With! Quick Shipment! Great Products and they know baseball ! Awesome batting ma-chine! My daughter loves it! She's hitting more solid! Thanks! CAN WE SAY AWESOME! Envy of all the kids ! Swing is already improved in two weeks! Best Thing Ever! Raised Batting Average 100 points since purchase! BatAction is a Super Built Machine! Made to last] I like it! Well Built! Great design, easy to use, oh and FUN! I've found the BatAction very good for developing a solid powerful level swing and teaching kids where to hit the ball! It's a important part of our practice program! AWESOME piece of hitting equipment. Excellent Training Aid! Great Machine! Nedco has prompt, friendly, and honest people! Our New Bataction Machine is Great! We hit it at least 4 or 5 times every we really improving! Great Response and Delivery! Great Machine for a hitting station! Excellent Equipment! Very Good Service! Highly Recommended! Great Product! Fast Service! My son will bat better! Great Product! Great company to deal with! Good communication and fast delivery. Fantastic Machine that is very well built! Nedco takes customer satisfaction very seriously.